RI Dermatology and Cosmetic center is committed to providing advanced aesthetic enhancements and Anti-Aging Medical treatments through MD developed, and supervised services. Our Staff is highly skilled and trained to perform with the most modern technology. Reduce wrinkles, reduce sun damage, reduce spider veins, tighten skin, remove unwanted hair, and more! Get driving directions and make an appointment now. 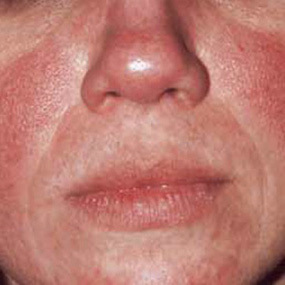 Rosacea occurs most often among people with fair skin who tend to blush or flush easily. It occurs more often among women than men, but men tend to suffer from more severe symptoms. Most patients experience multiple symptoms at varying levels of severity; and symptoms may appear on the neck, chest, scalp and ears.